Digital libraries are complex systems, intrinsically interdisciplinary and heterogeneous. They involve collaboration support, digital preservation, digital rights management, distributed data management, hypertext, information retrieval, human-computer interaction, library automation, publishing. Autonomy challenge — degrees of freedom in DLs needed for representing heterogeneous requirements; standards for interoperation. Construction plans for a distributed DL backbone. Generic infrastructure development & production. Perfect example for OA interoperability challenges with complete walkthrough coverage of all levels, e.g. semantic interoperability. Dublin Core Metadata Element Set (DCMES) as content agreements. Open Archives Initiative Protocol for Metadata Harvesting (OAI-PMH) standard as implementation. 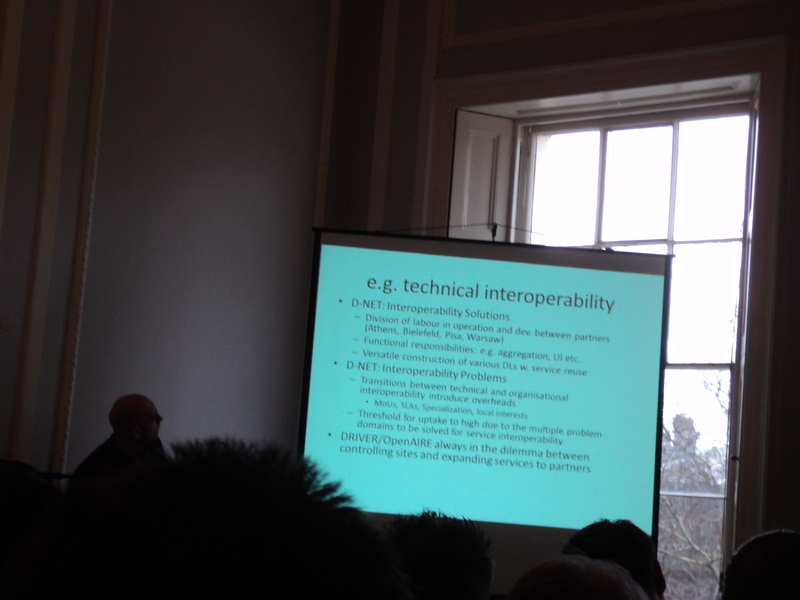 Addressing technical (transfer) as well as semantic (content) interoperability – with known problems. Content (semantic) and functionality (technical) to be decoupled as far as possible – Look deeper into the DL.org-RM? Separation of semanticists & technologists? The talk is available on the dedicated web page.